Anyone have this book? I read about it over on the Cook's Illustrated Boards. I started a batch of the dough this afternoon based on information I gleaned from the boards and some articles I googled. Here is a link to the author's website. tThere is a recipe for the basic dough in our Chicago paper and I'm thinking of giving it a try. I'll be interested to hear how yours works for you. I saw the accompanying video that is on the chicago paper's website. I bought the book after making the basic dough several times. I used to be a big bread baker. 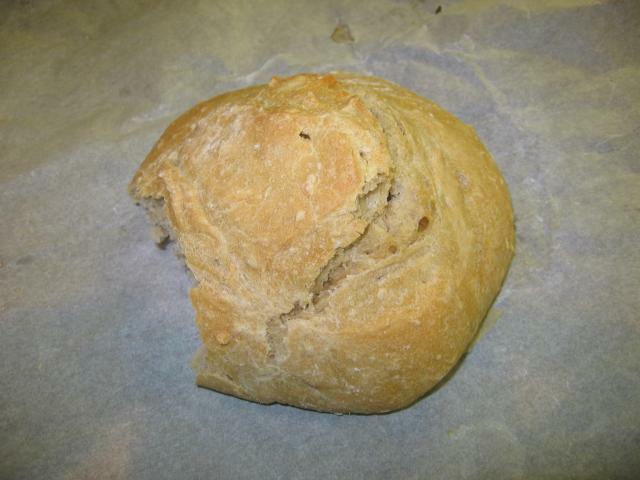 My favorite was a bread that took three days to make which had the most wonderful flavor. Unfortunately, life got too busy and I stopped doing it. I was thrilled when I saw the Bittman no-knead recipe. 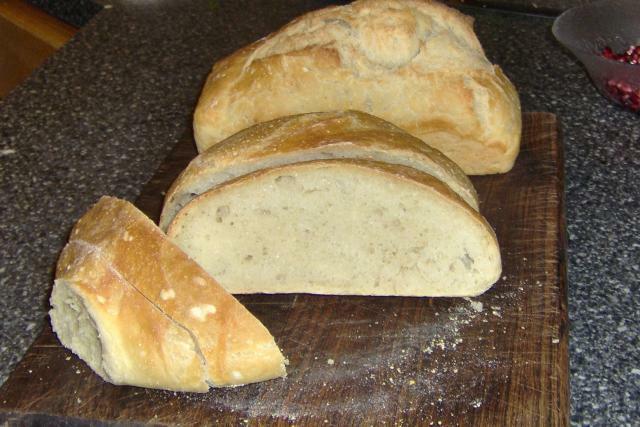 It didn't compare to my sourdough breads but was well worth the little effort it required. That said, I had some difficulties fitting the timing of the bread into my schedule. Therefore, I was even more happy when I saw the article for the Artisan Bread in 5 min a day. I really like the basic recipe. I too substitute wheat for some of the white. For the basic 4-loaf recipe, you should only substitute about a cup. Too much more and you have a problem with the rise. Because my family goes though if so quickly, I haven't been able to see how much sour dough flavor develops if you let it go towards the full two weeks. I still would like more sour dough flavor but, again, I am not complaining for the level of effort. Not only are we having fresh bread regularly, I like having it available for pizza whenever we feel like it. I also like the versatility of the recipe and the ability to form different shapes. I finally found a container large enough to make 8-loaves at a time. So, hopefully, I can see what the bread tastes like after a longer time period. We haven't made it past the 5-day mark so far. One of the suggestions in the book is to not wash out the container when mixing a new batch. They claim that the old dough will incorporate into the new and will add a little more sourdough flavor from the start. Over the holidays, I made the brioche recipe out of the book. I made four plain loaves and four loaves that I rolled out and filled with chocolate ganache. Everyone loved them and thought I had spent hours making them. Because the recipe has butter in it (obviously), you can only keep that dough for five days. I can't say enough for the veratility and wide range of recipes in the book. I have formed the loaves ito baguettes, rounds, etc. If I remember correctly, I think that the published recipe in the NYT article says to let the bread rise for 40 minutes. I think that the 40 minutes is for the first loaf before you stick it in the fridge. I was doing that originally for the refrigetated dough but then read elsewhere in the book to make it an hour and 40 minutes if the dough was refrigerated. Once I switched, I started getting a much better rise. Tomorrow, I am going to try the honey whole wheat. It uses a lot more wheat flour than the basic recipe allows by adding honey and milk to tenderize the dough. If I remember correctly, I think that the published recipe in the NYT article says to let the bread rise for 40 minutes. I baked a small tester loaf this morning. This is 3 day old dough. I thought it came out great. ( I took a little bite off the side) It has great flavor. I'm going to make an open faced sandwich for lunch today. I let it rise on parchment and baked it directly on that. I also subbed out 2 cups of KA white whole wheat flour for 2 cups of the white AP. You have to try it for pizza crust. We live in an area devoid of great pizza. The crust has good flavor and is nice and crispy. I have been baking it on a stone. We have crap pizza here too. I did bake it on a stone, although I was impatient and didnt really preheat it long enough. How do you roll it out though, its very wet!! I have the book. Have been making the no kneed NYT recipe for quite awhile and am interested in trying this. The last no knead recipe I did was like the CI suggested recipe except I used Guinness instead of a pilsner (I don't know that much about beer). Still turned out great, atleast better and more tasty than the original recipe. Have the two loaves of bread that I just made to eat BUT then plan to make this. Will report on the progress. I have just used some extra flour and rolled it out without too much difficulty. When all else fails, just use my fingers to stretch it a bit more. I heard about the method on the NPR program the Splended Table. We tried the recipe and here is the first result. 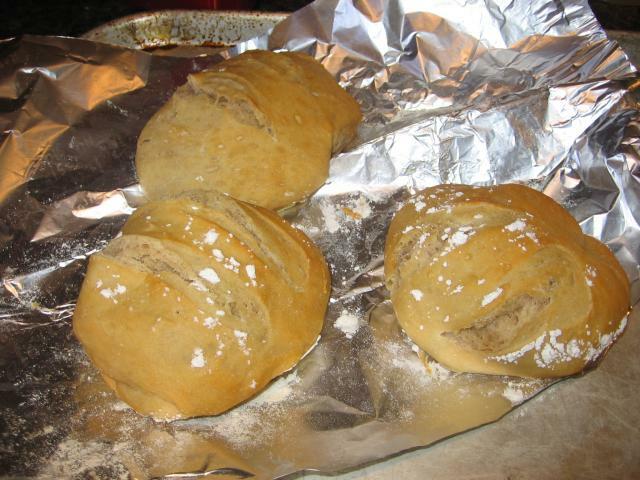 We have since tried by adding some whole wheat flour and the results turned out well. We intend to keep trying the improve the method. The bread looks great. Did you let it sit in the fridge for any length of time or did you bake it off right away? In the fridge overnight. The dough is very sticky and improves in texture when chilled. Since you are fairly close to Arva Flour, have you compared their products to King Arthur? I sure have. The protein content is different, I like the whole wheat flour from Arva, but they don't have bread flour. Additionally, they don't have white whole wheat( at least they didnt the last time I was there which was over a year ago). I mixed up my first batch of dough last night. OK, this should probably go into the "Absurdly stupidly simple cooking questions... " thread, but when you make pizza with this, do you prebake the crust or do you just roll it out, put the toppings on, & bake it all at once? Unfortunately the cookbook is out of stock on Amazon until the 25th. Because the dough is so wet, I'd partially bake it. I baked off 3 more mini boules this morning. Today is day 8. I LOVE the fact that I can keep this dough in the fridge and bake off at whim. They smelled divine while baking, I can definitely smell a more pronounced sourdough odor than on day 1 or 2. Hey Randi, do you have the book or are you using recipes found on the web? I could only find a recipe online for the basic starter. Your boules look great. What did the inside look like and how do they taste? What time and temperature settings did you use for the boules? Are you using your proofing function for the second rise? If so, what temperature? (Sorry for so many questions ). No, I dont have the book yet. I'm just using the basic recipe I found on the web. I did order the book, but its backordered. I'll try to take a pic of the inside next time. I used 400( convection drops it to 375) for 20 minutes. I just let it sit on the counter for 40 minutes before baking. I also used the throw hot water into a pan on the bottom rack trick. Not sure if that really does anything. I also baked them on a pizza stone but left them on non-stick foil for easy transport to the preheated stone. Is this the basic recipe? Yes, I believe that is the basic recipe. And thanks for answering all my questions, Randi! I'll try to post pictures of my results, too. Here is a great little video I found on Zoe Francois's website. Thank you Randi, for the help on the pizza crust. I might give this a try tomorrow night. Even though my dough will have been in the refrigerator only one day, I will almost certainly break down & try my first small loaf tonight. Your photos are driving me to distraction. Thanks so much for that video. I love to SEE something being done rather than reading the directions! Also glad to see the placement of the baking stone in the oven as suggested is different than what is stated in the book. I would have followed the book instructions to a T. This bread is in my near future!